When Sweden´s leading free daily METRO published a piece about the Great Pyramidin March, they asked their online readers to vote whether they would consider the Pyramid for themselves. We found the outcome quite impressive and made the screenshot above. 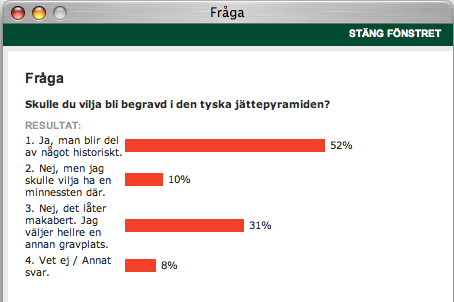 The Pyramid got a 52% Yes-response from Sweden. Sure, technically this is not a representative survey and the site didn´t say anything about the sample size, but since we received about 400 hits from Metro´s homepage, we guess 100% equals about a couple of dozens votes. 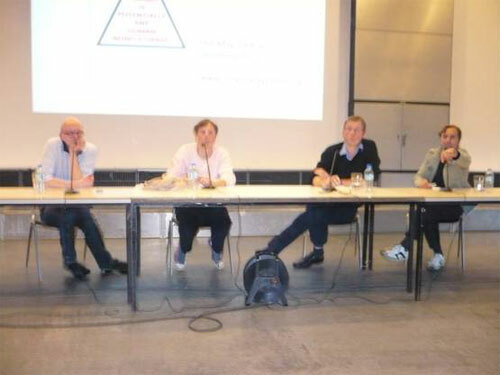 The Pyramid likes Sweden too..
Last Monday night culminated in these three numbers when Ingo and I presented the Great Pyramid project at Kunsthochschule Kassel (Kassel Art School) upon invitation of Oliver Vogt, chair in industrial design there. Oliver on his part invited Philipp Oswalt, professor of architectural theory at the school, to join us on the panel to discuss the Pyramid with the fifty-or-so visitors that evening. I first gave a thirty minute presentation; Oliver, Philipp and Ingo then reflected on a couple of issues before the mic was opened to the audience to voice their own thoughts and questions. It went as usual: Most introduced their statements/ questions with „I really think the Pyramid is a very cool/practical/amazing idea, though there´s a few things I would like to ask/mention ..“ We like people asking questions and sharing their own ideas. Thoughts and questions help us to understand what the Pyramid project actually could mean, since we ourselves try not to narrow down the Pyramid to have too particular meanings. It will be what all of us make of it, it´s a platform. Thank you everybody who came; it´s been truly inspiring. At the subsequent dinner, Philipp raised quite some doubts. As a thought-provoking investigation into media culture, the Great Pyramid would be just great – but will it really, really work, he was worrying? We were a bit worried too, recollecting his panel contributions we might not have been able to grasp entirely. It may be these years of shrinkage discussions that turned Philipp into something very unlike us: a professional sceptic. He was founding head of Shrinking Cities, an acclaimed and very thorough research and exhibition project that investigated challenges and prospects of population-wise rapidly diminishing regions in various parts of the Western world. It may be an inclination towards theoretical instead of hands-on practical investigation and analysis as well. It may be none of that. What we liked a lot about Philipp, however, was his longer-term perspective on things that provided us with the slightly enigmatic numbers in this post´s header. Philipp challenged us and we gladly accepted his bet: a six-bottles case of champagne if the Pyramid would not contain 10,000 stones eight years from now. We were briefly considering whether lustily sparkling champagne might not be a bit inadequate – but as Ai Weiwei has worded it as well as squarely in his TGP competition entry: „Celebrate death as part of live!“ So, we rest assured and look forward to seeing the arrival of six inconspicuous bottles of Philipp´s choice before May 2016. What, if we ourselves could make a selection instead? Krug? Cristal? We guess, we would settle for modest Piper Heidsieck Cuvée Brut or no more than Taittinger Brut Réserve.. – As in: Granite? Marble? Thanks, but no thanks – plain concrete will do just nicely..